We know how very much dogs are part of the family and do not want to be left behind when you go away on holiday, so we provide pet friendly accommodation at Rayle Farm and feel sure they will enjoy this lovely part of Cornwall as much as you will. There are some delightful walks from the farm ranging from a pleasant ramble down the old tram road to Portreath which can then be extended into a longer circuit by coming back through Illogan woods (lots of choice dog-sniffing there amongst the trees and undergrowth! ), to a wander through the nearby Tehidy Country Park, to a shorter walk up the footpath to neighbouring Illogan. Then, of course, the magnificent Coastal Footpath, much of which belongs to the National Trust in this area, is just down the road. In your cottage you will find a list of all the summer dog-friendly beaches in Cornwall – there are many of them. Our nearest ones are at Gwithian, St. Agnes and Perranporth all within a 3 to 7 mile radius. In summer, dogs are allowed on Portreath beach after 7pm. which makes for a lovely evening stroll. 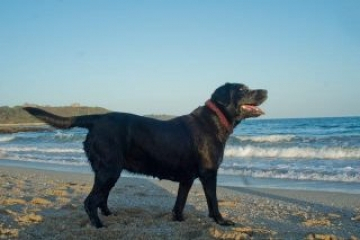 Between October and Easter there are no dog restrictions on any beaches to worry about. Your dogs might also enjoy accompanying you to one of our local pubs for an extra helping of fuss and attention.